The Range Lantern E8552 utilize highly efficient LED technology to provide a narrow high intensity light beam guaranteeing nighttime visibility range of up to 14 nautical miles. 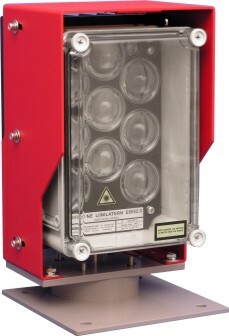 The light consists of an inner light unit box with a transparent polycarbonate front cover and anodized back cover, housed inside a powder painted outer metal enclosure with hot zink coated base plate and adjustment facility. Optical and electronic devices: LEDs, custom lenses, and a controllable power supply unit - are protected from the environmental influence to IP67. The E8552 lights are currently available in one of the three colours. red, green, or white. At the installation site, the light will be fixed to the host structure by the base plate. 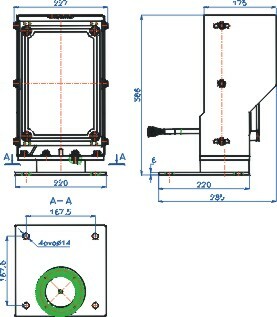 Direction of the light beam around the horizontal axis can be adjusted by rotation of the enclosure with the light unit. Direction of the light beam in vertical plane is adjusted by deflection of the light unit within the outer enclosure. For the precise adjustment of the light beam, an optional optical sight mounted to the upper backside of the light can be used. CAUTION: LED light units are sources of bright light, do not stare directly into the beam from close distances and observe all the warnings and guidelines in the Instruction Manual. ektaTM E8552 LED Range Lghts are classified as Class 3R LED devices with maximum optical power of 300mW (emitted wavelenghts 400 to 700 nm) according to the standard IEC 60825-1:1993+A1:1997+A2:2001.